Writing novels is really no different from birthing children. We plan, we create, we add equal parts pain and anguish and excitement, and when it comes out…each one is miraculously unique. 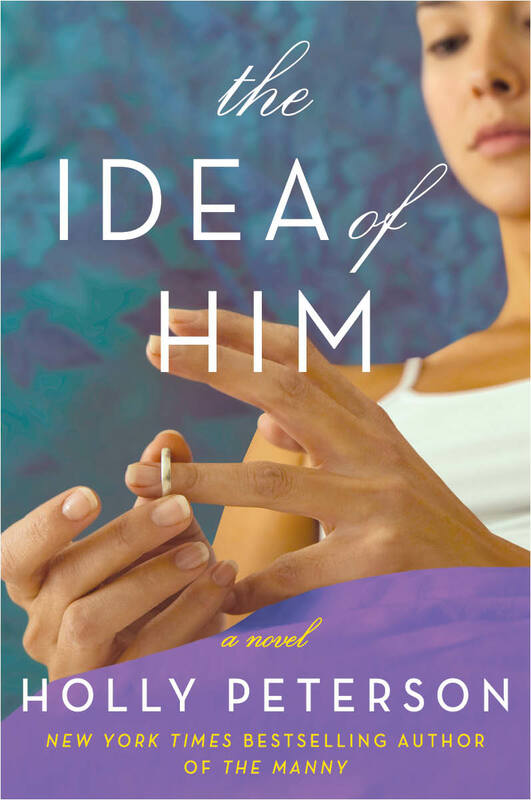 My new book, The Idea of Him, was very different from my first novel in that the story was harder to tell. This new book is much more poignant, not better, but a deeper emotional study. Like one of those rocket style, delivery stories with panicked nurses and no time for anesthesia, my first novel, The Manny, came out quickly, written in the wee hours night. It flowed out of me every evening in six months record time after my family went to sleep. I couldn’t write as fast as my mind was spinning out the pages. I wrote this second novel during a time of change in my life. I wasn’t as busy logistically this time: I wasn’t keeping vigil at Memorial Sloan Kettering Hospital for an ill family member, working at a demanding (and failing) magazine, or arguing with plumbers over tile with a tortured renovation as I was during the time I wrote The Manny…but during the writing of The Idea of Him, I was busier inside. By that I mean, I was changing inside…busily changing…sometimes manic-ly changing. The only thing that calmed me down during this period was my newfound, (yes at age 42! 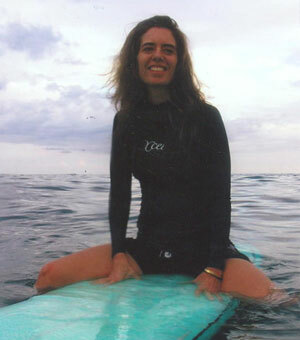 ), love of surfing and the healing powers of the ocean’s saltwater. In the past five years, I got divorced, adapted to that (kind of), helped my children function in a new family structure and all the while tried to figure out what propels people to love, to stay in relationships, to convince themselves this is the one, or, harder, to admit to themselves this actually wasn’t the one. I asked myself often, “What is love?” Is it a partnership that really works in tandem as I definitely had with my former husband? Was that real love or was that a really good pairing of two like-minded people with shared values and ability to get things done they as a team? Sounds a little dry, but, honestly, maybe it was. Maybe my marriage was more of an amazing partnership than real love. I love a lot about my former husband and admire him immensely but I’m not sure it was the right kind of love or we would have stayed together. So what is real love? Is it the desire to go to every movie, play, museum, summer BBQ event, restaurant, and outdoor walk anywhere with that person? Or, put more simply, is it the feeling that you want to, that you must, share everything with that person? That’s how I feel about the man I’m dating now who was my close friend for years before, but, then again, I also feel that about my gay best friend Peter. Is wanting to share every great experience the definition of true love if I feel the same need with Peter? And what about when things don’t work out? Why don’t they? Is it because something about the union was never there we thought was there? That’s what I wanted to write a book about this time. How we fall for the idea of another person and what that person will bring to us…a sense of being cool, comfort, a reminder of Daddy, whatever…and then when we dive into a relationship with that person, something’s missing. Is something missing because fell for an idea over the actual person? Sounds crazy but I did that several times and every time I mention the title of my book, the person across from me says, “Oh God, I did that too.” The cool rebel guy in college with long hair, the Frenchman with that accent and manners whom I think I fell for only because of the way my cheek felt on his soft cashmere blazer, the responsible, good on paper, Daddy replica. Those men were ideas of what I thought I should have…but not necessarily the men I related to or felt any intimacy with. Once we are in a relationship, and we don’t feel it’s quite right, why do we stay? What about BEING ALONE is so damn terrifying to men and women alike that they’d rather stay with the wrong person? I wanted to write about that universal fear as well. I tried to write a book about things that people really feel. Good things and scary things. That first brush with love, that longing for the one that got away, that angst over the hot person we wish we never met, that confusion over whether we are in the right relationship, and that very scary fear of leaving and being on our own. When we end a relationship or get divorced, we have to face that fear head on. What we do with that fear will define big choices with huge ramifications in our lives. Some of us run to the next man because we can’t imagine life on our own…but I can assure you those Saturday nights alone with corn flakes are blissful. We all deserve some time to think and reflect on our own terms after a hard week of work, whatever kind of work we women do — whether it’s stay-at-home or out of the home or both. We have such intense fear of those Saturday nights or of being without a man, and I say, having been on the other side of that “alone” precipice, it’s just fine, you’ll see…another mate will come in time but give yourself some breathing space to decide what you want next. This is all to say that writing a novel is like birthing a child, but, for me, it also included a deep process of coming to terms with things. I was very busy figuring out my feelings in the past five years while I still worked and mothered my three children very intensely. And while all writers say this or that character is not me; we do put our own emotions and reactions and experiences on the page in some form. Allie Crawford, the main character in my novel, is trying to leave a marriage and she finds that precipice of being on her own terrifying. She clings to other men, maybe Mr. Right, maybe Mr. Wrong, in the form of a male life raft to “save” her. Through female friendship with an unlikely ally, she learns to trust and relish herself. That’s what I wanted to write about in this book: a woman who has so many fears about being on her own that she can’t stop and appreciate the gifts around her that will fulfill her no matter what turns her love life takes. Too many of us forget ourselves and how grateful we are for our children, our work, our passions, our families, our friends and we stress over some guy who isn’t even worth it in the end. I wanted to write about breaking free of those obsessions and fears and learning instead to relish oneself…a message so many women out there need to hear. Birthing a novel about all that wasn’t easy, but I think you’ll find very, very real.